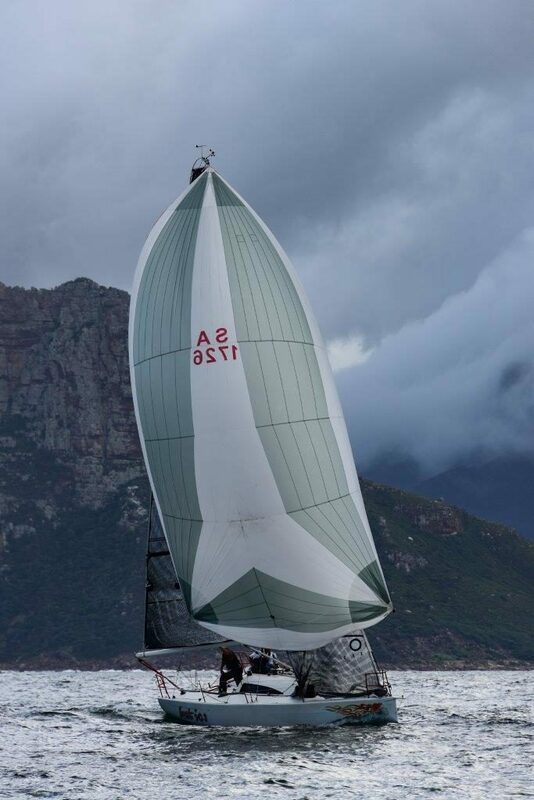 Hout Bay Yacht Club’s 2019 Admiral’s Regatta, now in its 29th year, was held from 12-14 April and was the host for the inaugural 2019 South African ORC National Championships, two other keelboat classes, and the only offshore open class dinghy regatta in the Cape Town Sailing Calendar. The story behind the name of the regatta is rather interesting: when the Round Table organisation of Hout Bay decided on a major fundraiser in 1986 – with the idea to proclaim Hout Bay a “Republic” – the idea was daring and promised multiple media exposure, thus the “Republic of Hout Bay” was unilaterally declared and a “President” elected. Minister portfolios were up for sale as the main source for the fund raiser and a well-known businessman in Hout Bay, with his ownership of a genuine minesweeper purchased from the navy, became the “Minister of Defence” and thus he instantly became known as the “Admiral”. 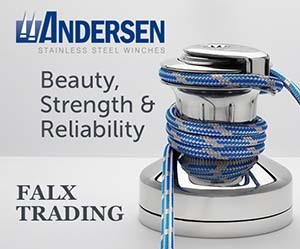 In 1991 the “Admiral” agreed to sponsor a regatta to be sailed over a long weekend in the waters of the South Atlantic off Hout Bay. There was also clearly a little jibe here at RORC’s Admiral’s Cup. This was the birth of the Admiral’s Regatta, which has been sailed ever since during March or April. 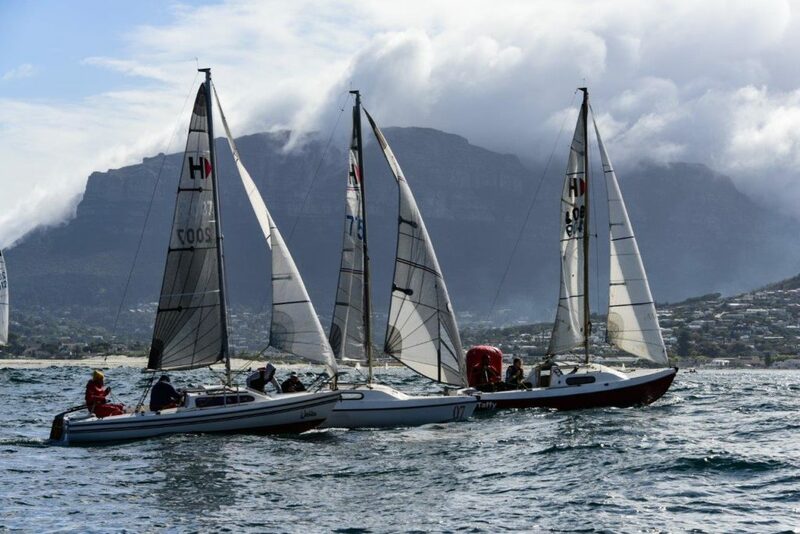 Hollard Jacana – winners of the ORC Nationals. 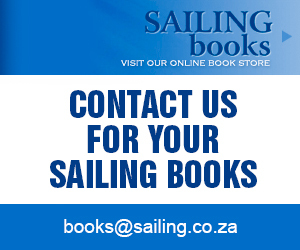 Good sailing sponsorships are difficult to find in these tough economic times, and yet vital to growing the sport of sailing in South Africa. 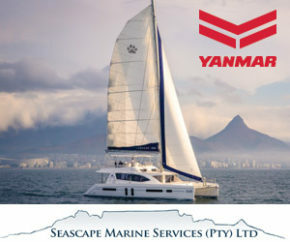 It is therefore a good news sailing story that LTC Phoenix (Literally Tax Consulting Pty Ltd and Phoenix Business Consulting Pty Ltd), sister companies that also been behind HBYC’s Lipton campaign, the Hout Bay Youth Sailing Development Trust and a Cape to Rio campaign, are in their third year of a five year commitment as a sponsor for the event. As welcomed additional support for the regatta this year came from the Jewish Maritime League, who generously sponsored the development sailors. Running the growing regatta for the third year in a row was Regatta Director Peter Roeloffze and his committee of Regatta Manager Kirsten Veenstra, Race Director Doug Alison and On-the-Water Manager Pierre Albertyn. 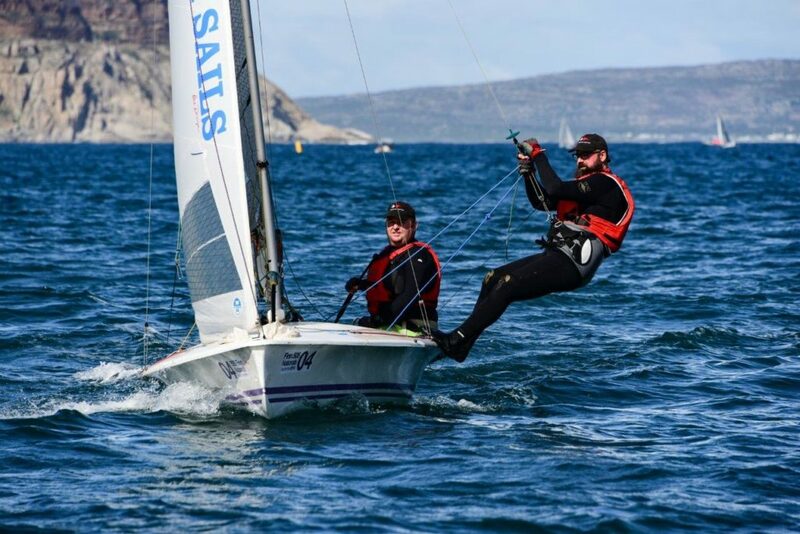 The LTC Phoenix Admiral’s Regatta has been growing well over the last three years and is no mean feat to organise as it involves a dinghy regatta, a small inshore keelboat regatta, a medium distance offshore sailing class and this year the SA ORC National Champs. This means over 220 competitors, a volunteer contingent of 30-plus people, three bridges, four race officers and seven mark laying and rescue craft. This year’s Race Officers were Doug Alison as overall Race Director, Rob Willcox running the two offshore keelboat fleets, Mary-Ann Sharwood running the dinghy bridge and Tom Ambrose running the inshore keelboat bridge, which has grown to 13 Hunters. Day one of the regatta on Friday 12 April had racing scheduled for the offshore keelboats only. It featured very light winds with lingering fog, and although the race committee and the entire fleet were out on the water and ready to roll, ultimately there was no racing due to the lack of wind. Instead, Race Director Doug Alison and Offshore Race Officer Rob Wilcox decided to make the most of the afternoon out on the water by introducing a fun “race” back to the marina in Hout Bay Harbour, with the first boat in winning a magnum of Hout Bay Vineyards’ Petrus, generously donated by the Regatta Chair, Peter Roeloffze. In the ORC fleet, the aptly named J/11, ‘Tenacity’, was the only boat to stick the race out, and finished before 18h00, and the winner in the Medium Distance Class was ‘Corum’. Day 2 of the regatta dawned with the potential of fantastic weather and a consistent and favourable mid-teen breeze. As the fleet cast off their moorings and headed out beyond the dramatic mountainous amphitheatre that surrounds Hout Bay, that prediction appeared to be coming true: a light breeze from the south, building to the early mid-teens by 10h00, and staying there until mid-to-late afternoon. Alas, it was not to be. There was some light rain about and a short period 1.5-2m swell made a bumpy ride for the Offshore Keelboats. 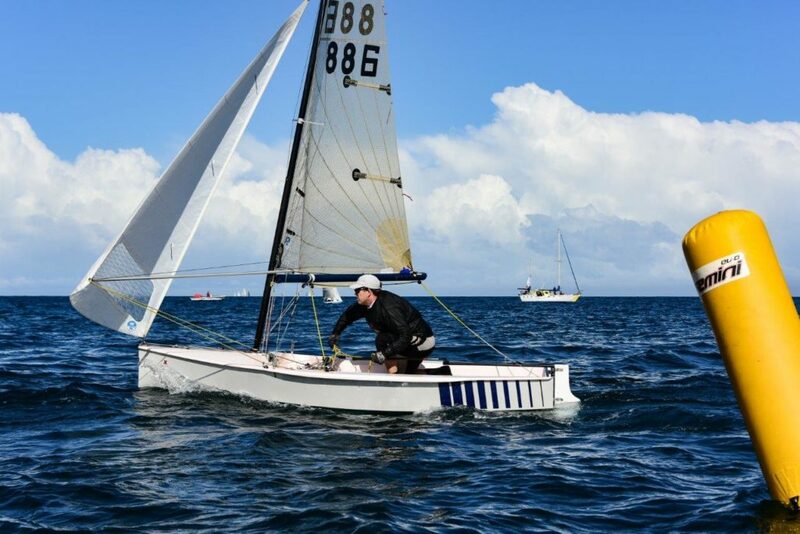 The wind did build initially, but faded during Race One for the offshore classes, and the first ORC Nationals race was shortened from a 3 lap Windward Leeward course to a 2-lap race. In Race 2 of the ORC Nationals, the J/133 ‘Hollard Jacana’ recovered from a slow first round with a strong second lap, being on the inside of a wind shift up the second beat, to take the win by a minute on corrected time. Behind them, the Cape 31 ‘CuAl (PO ) (OH) •4H O’ took second, with third place tied on corrected time between the J/111 ‘Tenacity’ and the Cape 31 ‘Nemesis’. 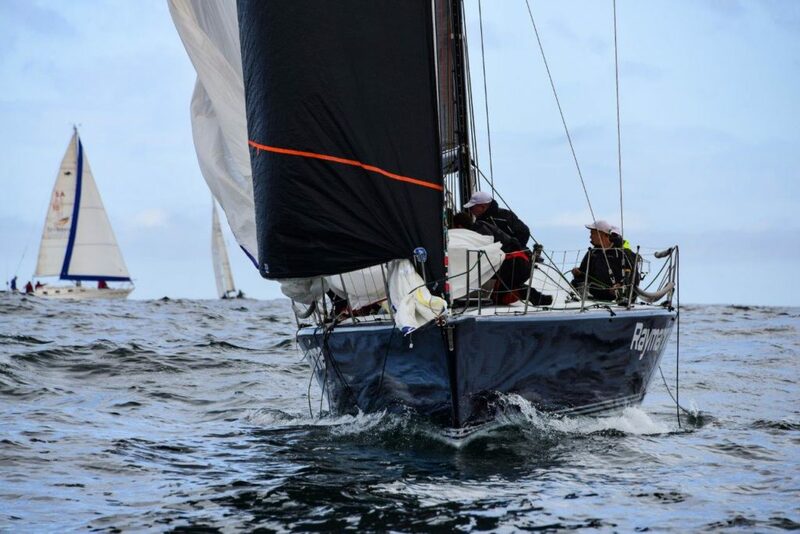 In fifth place, the Mount Gay 30 ‘Hot Ice’ was followed closely by the Farr 40 ‘Regardless’ and the Cape 31 ‘Ski’ which recovered from being OCS at the start. Less than 5 minutes separated the corrected times of the first nine finishers, with just three minutes between 3rd and 9th. There was a boat-for-boat battle royal between ‘Blue Tango 2′ and ‘Triton’, who were in close combat the entire race, before finishing within a second of each other on elapsed time. With Race 2 starting once the course was realigned for a 10-15° wind shift to the west, a 4 lap Windward Leeward course was set in a new early teen breeze that went lighter after the first half hour. The elapsed time of the race ended up being 2-3 hours across the fleet. ‘Hollard Jacana’ were OCS at the start, and had to go back, leaving the left side open for the front runners to charge. At the weather mark, it was ‘Nemesis’, ‘Regardless’ and ‘CuAl (PO ) (OH) •4H O’ at the front. As the conditions went lighter, and the swell stayed bumpy, waterline length came to the aid of the longer, bigger boats, and they gently cut into the Cape 31’s lead, ultimately with ‘Regardless’ and ‘Jacana’ overtaking the intense battle between the Cape 31s ‘Nemesis’ and ‘CuAl (PO ) (OH) •4H O’ putting some distance between themselves and the littler boats by the finish line. ‘Hollard Jacana’ did enough after a bad start to take the win. ‘Hot Ice’ sailed beautifully in the light conditions and clawed her way back after lap 1, where she rounded behind ‘Scarlet Sun’, to place second in this race, dispelling the myth that the ‘Cape 31′ boats are unbeatable in class B! ‘Nemesis’ just managed to keep a charging ‘CuAl (PO ) (OH) •4H O’ behind her to take 3rd, followed by ‘Regardless’ in 5th, then ‘Tenacity’, ‘Scarlet Sun’, ‘Ski’, ‘Rocket’ and ‘Blue Tango 2′. Elisa Falcon & Jodie Plakkies. The Medium Distance Sailing Class enjoyed one long and challenging race in tricky and variable wind conditions. On the Dinghy course in the bay, the competitors enjoyed four races. 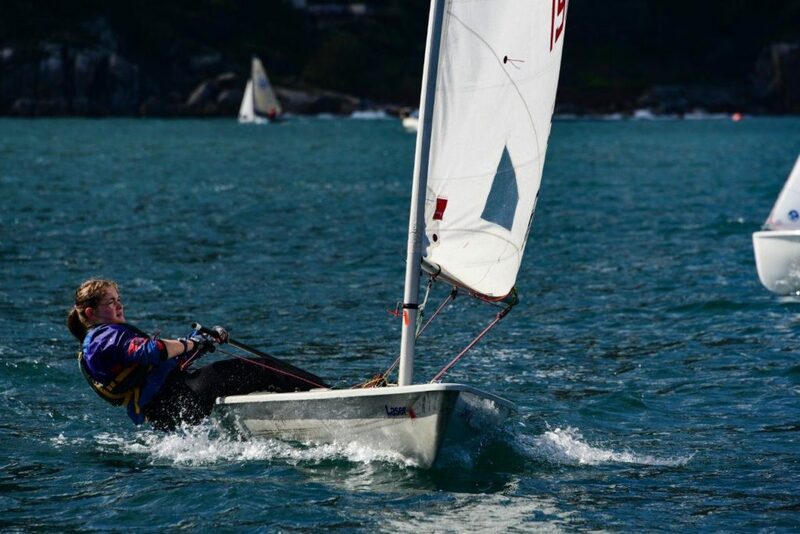 The boats entered included the senior dinghy classes Extras, Sonnets, 505s, Lasers and Laser Radials and 420s. At the end of the three races, Owen Middleton from IYC was in the lead, followed by Ian MacRobert from VYC and Ross MacKinnon from ZVYC lying third. On the Inshore Keelboat course, 13 Hunters competitors completed four races. Theo Yon and Andre Julius, sailing ‘Vuma’, took two races to get used to sailing the Hunter they had only finished getting ready to sail the day before, and then they went on to win every race from Race 3. A wonderful touch after racing was complimentary Urban Brewing Co. craft beer, served to the competitors on the dock as they came in after racing. This was followed by prego rolls and a social evening at the club. Sunday brought rainy and windless, and some wind forecasts looked rather dire, but the wind came up around 10h00 and laid on the best racing of the regatta. Day 3 turned out to be a highly enjoyable and variable final day on the ORC Nationals course. The J/133 ‘Hollard Jacana’ led coming into the final day. Just one point separated second from fourth place, with ‘CuAl (PO ) (OH) •4H O’ followed by ‘Nemesis’ and ‘Hot Ice’. Three Windward/Leeward races were held in a shifty northerly, bending at times around the tall spectacular Sentinel mountain peak at the entrance to the bay. Race 3 saw a shift claim some and benefit others in a game of snakes and ladders. No doubt the podium finishers in the race will be thrilled with their performances: ‘CuAl (PO ) (OH) •4H O’ claimed their first win of the regatta, followed by ‘Scarlet Sun’, a previous winner of the Admirals Regatta and Sword two years ago, then ‘Regardless’, ‘Hot Ice’ and ‘Hollard Jacana’ in fifth. Race 4 again saw some shifts in the breeze, with a cross swell to factor in on starboard tack and a following swell on port on the beat. ‘Hot Ice’ claimed the win, followed by the smallest boat in the fleet, ‘Blue Tango 2′, and then the consistent ‘CuAl (PO ) (OH) •4H O’. After four races, everyone could breathe a sigh of relief – the fleet had a valid National Championship per the Notice of Race. But the weather and timing looked good for another race, which would also introduce a discard. It all came down to the last race. 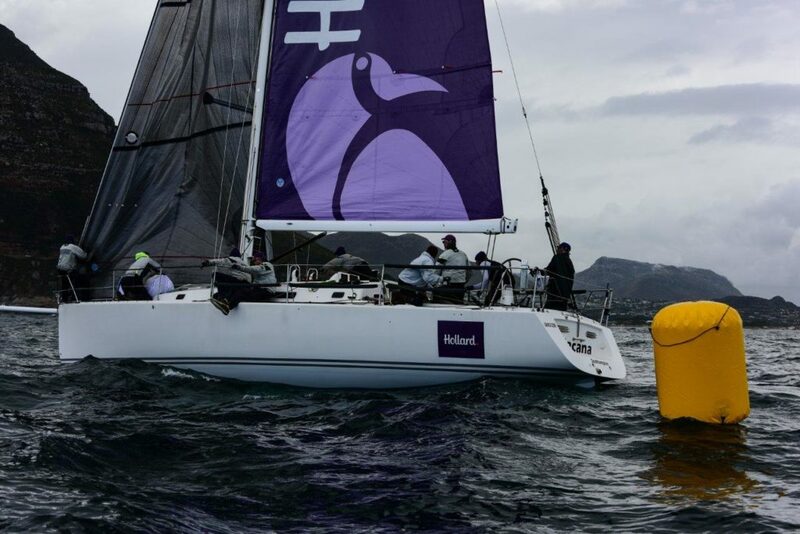 ‘Hollard Jacana’ pulled out the stops to claim a win in the final race and win the 2019 ORC National Championships, followed by ‘Nemesis’ (last year’s winners of the Admirals Sword), ‘Regardless’ and ‘Blue Tango 2′. 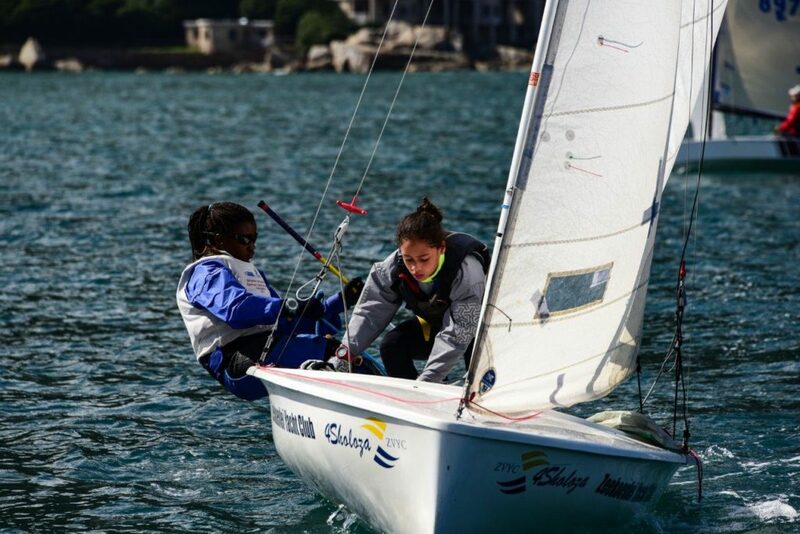 ‘CuAl (PO ) (OH) •4H O’ and ‘Hot Ice’ picked up their worst scores of the regatta with a fifth and sixth respectively, and the snakes and ladders turned the top scoreboard upside down. On the Dinghy course three races were enjoyed in a decent breeze. The Medium Distance Sailing fleet managed three races, the last being the traditional John Coles sprint race from the finish line of the last race to the harbour wall. The ORC boats had the option to do this race too. Kudos goes to Peter Roeloffze and his organising committee for a fantastically organised event – The LTC Phoenix Admirals Regatta will certainly grow further in the years to come LTC Phoenix in for the long haul, The Admiral’s Regatta is already one of the major multi-club keelboat regattas in the Cape Town sailing calendar. There is certainly big scope for it to become one of the very few major offshore dinghy regattas in the calendar. Big thanks of course to Doug Alison, Rob Willcox, Mary-Ann Sharwood and Tom Ambrose for fantastic racing, and to all the boats who came over to HBYC from other clubs. 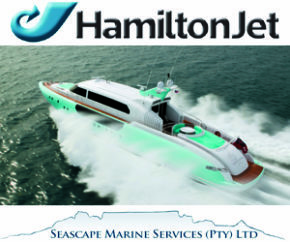 And of course, to the sponsors: Literally Tax Consulting and Phoenix Business Consulting, the title sponsors; major sponsors the Jewish Maritime League, Hout May Marina and Hout Bay Superspar, and sponsors Muriel’s Munchies, Ullman Sails, Seaport Supply, Chapmans Peak Hotel, Hout Bay Vineyards and Urban Brewing Co. 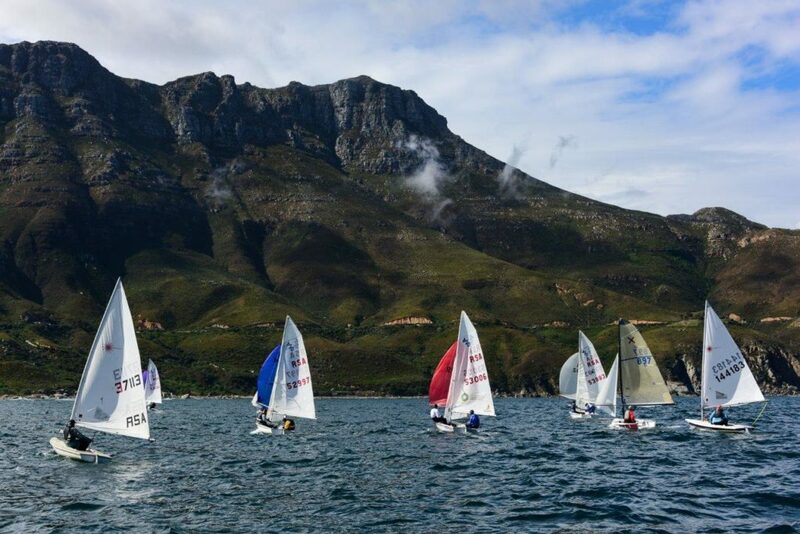 The 2020 LTC Phoenix Admiral’s Regatta is schedules from 13 – 15 March 2020 at Hout Bay Yacht Club.